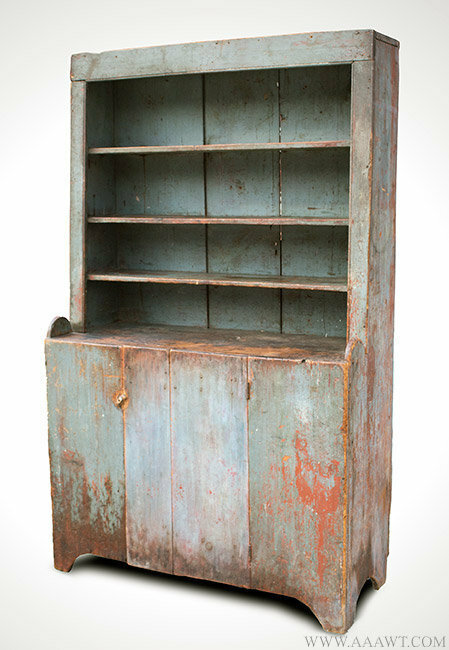 A painted pine apothecary cupboard constructed in two sections; top section features a flat molded cornice above four shelves. 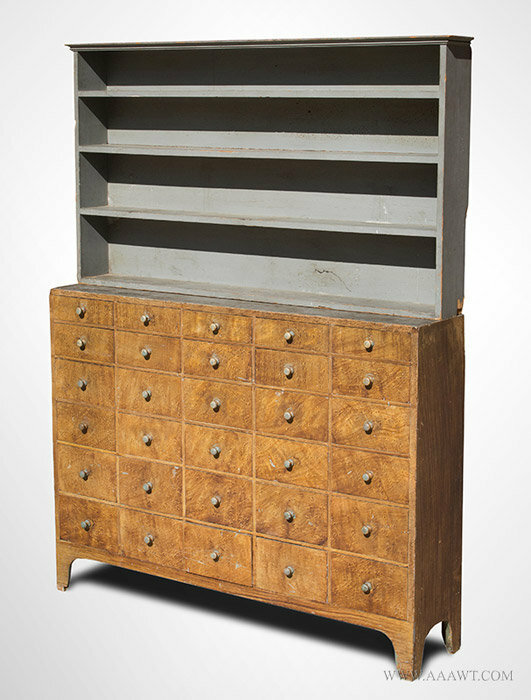 The upper case resting on the lower case containing 30 graduated drawers with turned wooden pulls; the whole raised on cutout base. 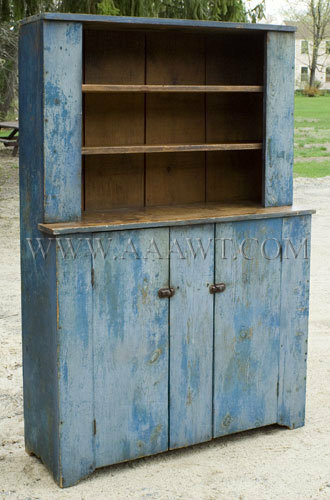 The top section is painted blue, the lower half is faux-grained; painted [or paint-decorated] to resemble bird's-eye and tiger maple, over blue (same blue as top case). 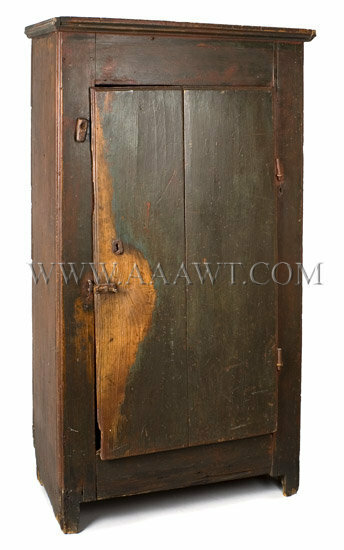 Dimensions: H: 67.5"; W: 81"; D: 10.25"
There is some wood loss to lower-back side of upper case, otherwise very good, commensurate with age and use. 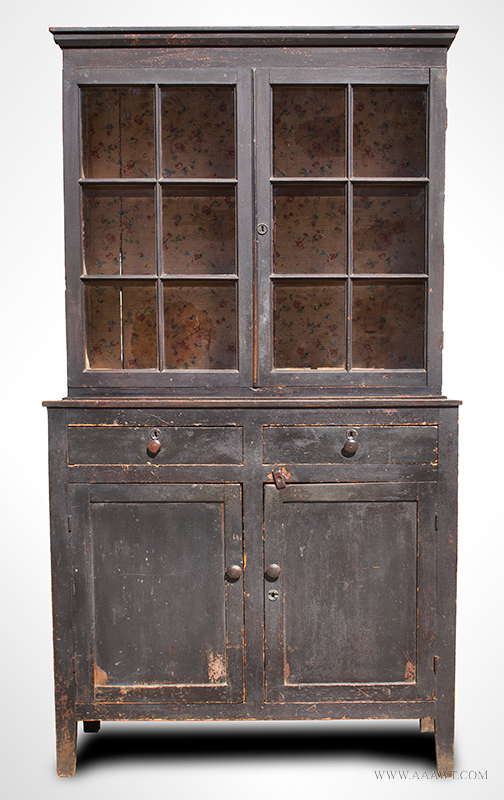 In good condition with added turned knobs and a Victorian cast iron latch; one backboard replaced; cupboard was intended to sits on floor with no base. 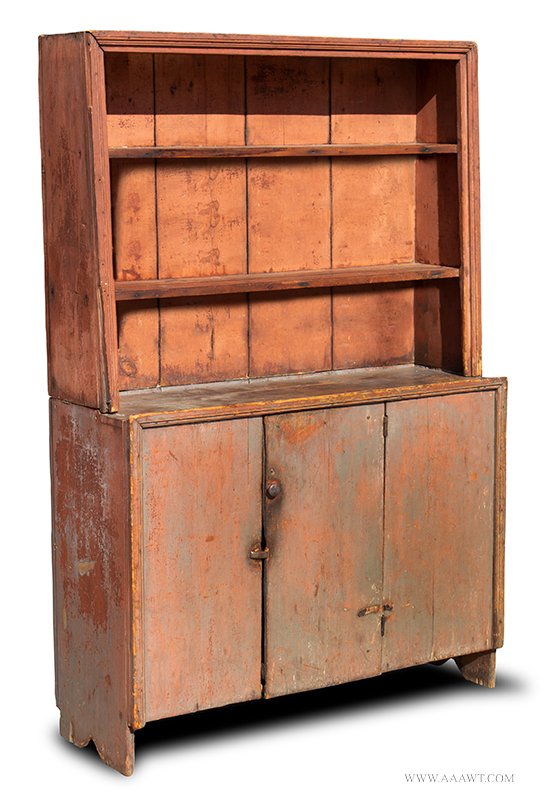 Dimensions: 68.75" H, 41.75" W, 18.5" D.
The case with crown molding is constructed of boldly figured curly maple; hinged, paneled doors opening to three shelves; with short drawer in the midsection centered by a pair of recessed panels of conforming height, two hinged doors below, on cutout base joined by ogival apron (rail). 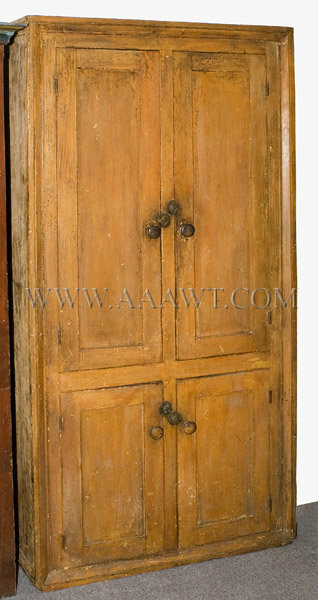 Wonderful hand-wrought iron hinges, old surface. The pediment rising to a pair of scrolls centering a domed apex with returns above the case featuring bold applied moldings centering a fielded panel door opening to a pair of shelves. 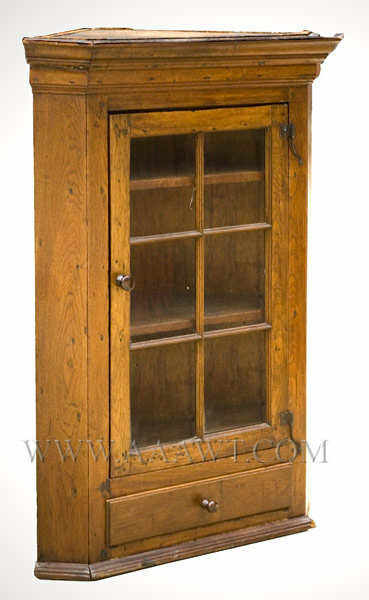 This item just in, more information may follow, please call if interested. 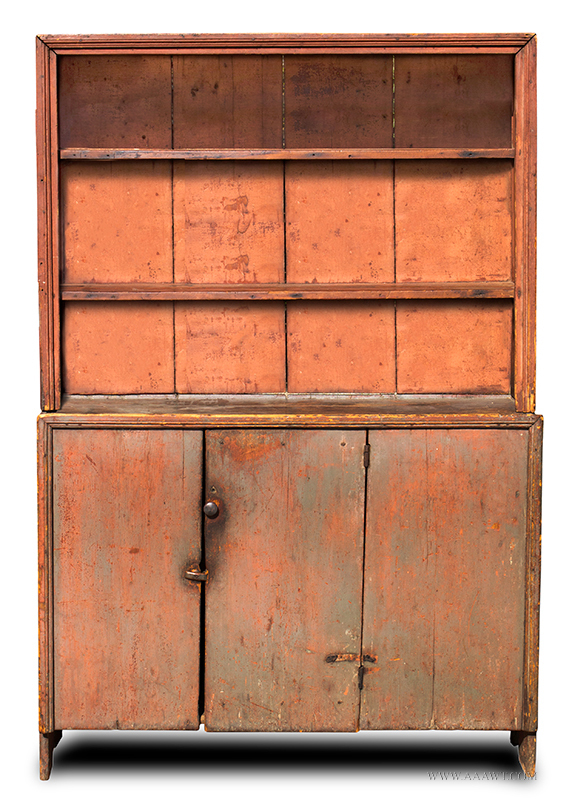 The simple case raised on cutout feet features a pair of paneled doors within beaded molding that open to reveal three fixed shelves. Dimensions: 60.5" high, 38" wide, 19" deep. Dimensions: 23.25" high, 13.875" wide, 8.5" deep. 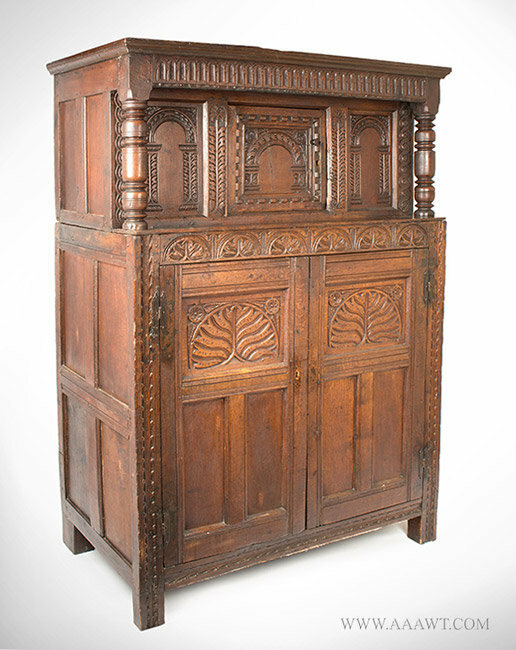 The scalloped gallery above the case which is of mortis and tenon construction and features flat panels; two short drawers above a pair of conforming paneled doors...the whole raised on a molded base standing on turned turnip feet. 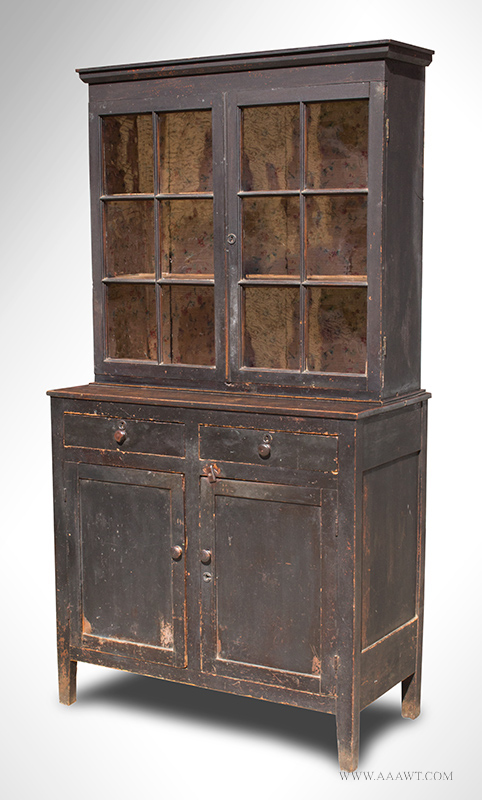 This cupboard remains in excellent original condition with left proper side base molding restored; left proper rear foot extended and brasses are period replacements. Dimensions: 51.5" high, 43.25" wide, 19" deep. 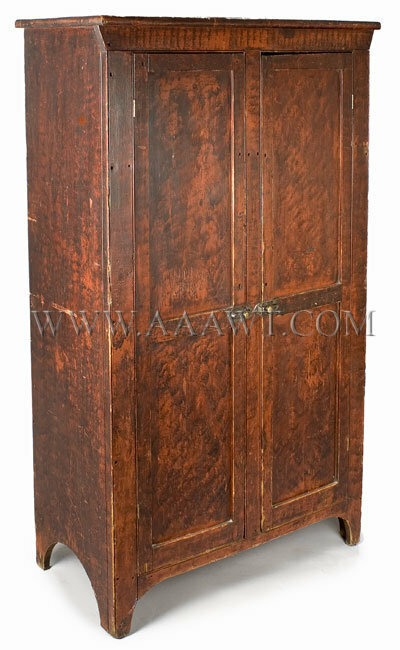 Hard pine with strong traces of old red paint revealed by the removal of later over-paint; scalloped ornamentation is authentic and unaltered; the door is a very old "working-period" replacement; some height loss otherwise very good. 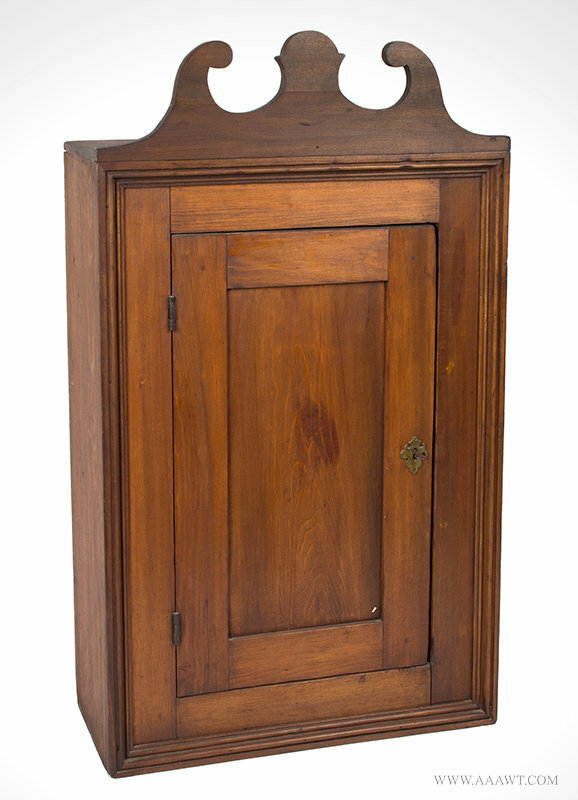 This outstanding cupboard is similar to one in old brown paint over original reddish-brown that is displayed in the Hardenbergh parlor at Winterthur. 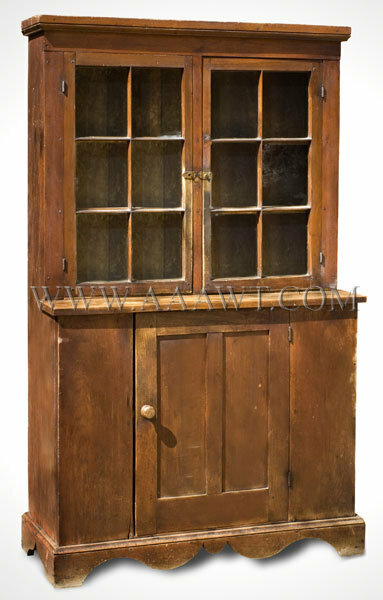 Historic Deerfield owns two cupboards of this type that feature shaped fielded raised panels on the fronts, one of which is repainted, the other refinished with replaced feet. 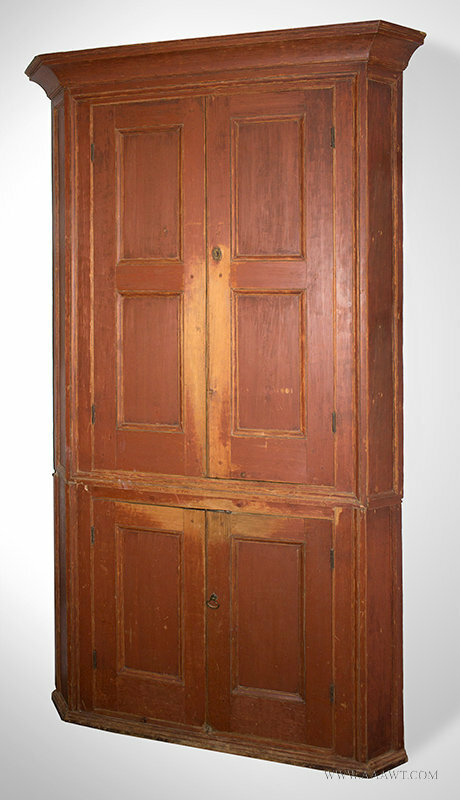 Dean Fales noted that the two cupboards at Deerfield are a "local type made in or near Deerfield; (and) While these cupboards do not have known histories, a similar painted one at Winterthur was owned by Osmund and Winifred Skinner of Shelburne, a town just west of Deerfield on the Mohawk Trail. 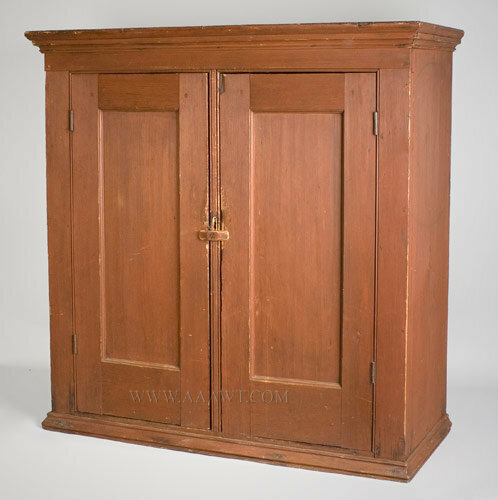 Another related cupboard was found just North of Greenfield in Bernardston." 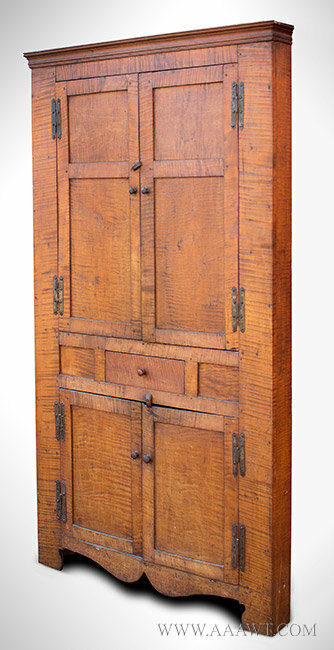 Philip Zea affirmed the locality of Deerfield as the origin for these cupboards and acknowledged the use of relatively thick boards of hard pine in their construction. 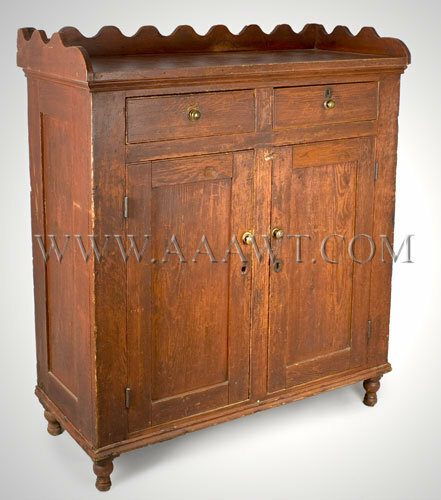 It is interesting to note that this same hard pine is used for the tops and as secondary wood in Hadley chests produced in the same region. Advertisement for Louis M. Ream, Esq. in the Magazine Antiques, January 1928, page 3, and Jay Cantor, Winterthur (New York, 1985), page 175. Article on Historic Deerfield in The Magazine Antiques, September 1956, page 232, Helen Comstock, American Furniture (New York, 1962), figure 190; Dean A. Fales, Jr., The Furniture of Historic Deerfield (New York, 1976), page 252, figures 493 and 494. Wallace Nutting, Furniture Treasury (New York, 1928) figures 497 and 505. 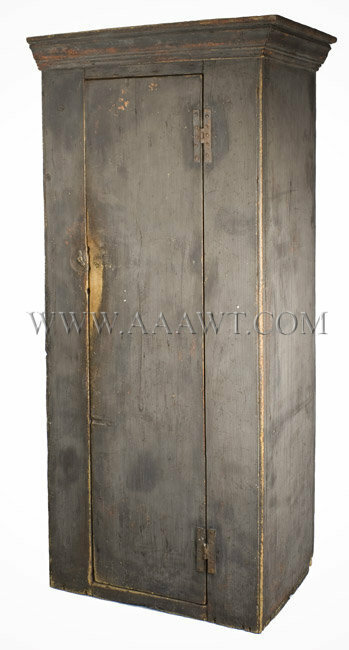 Height 77", Width 45", Depth 17 3/4". Crown molding above 6-light door hung from rat-tai hinges. 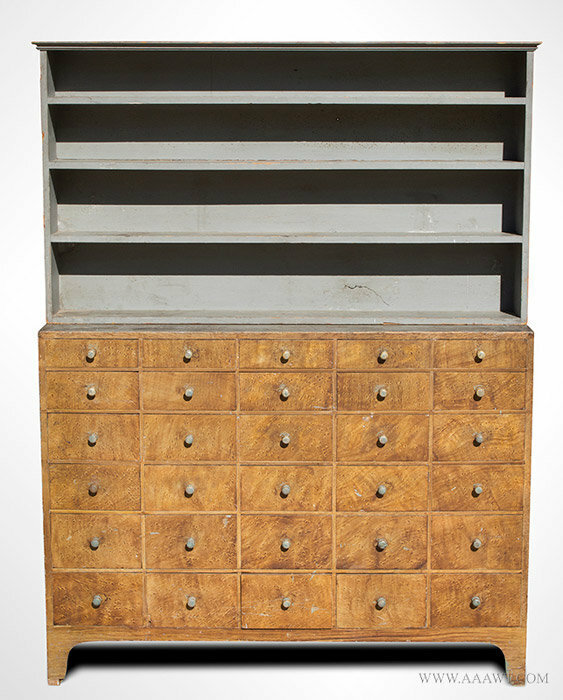 The drawer conforms to case and is of dovetail construction. 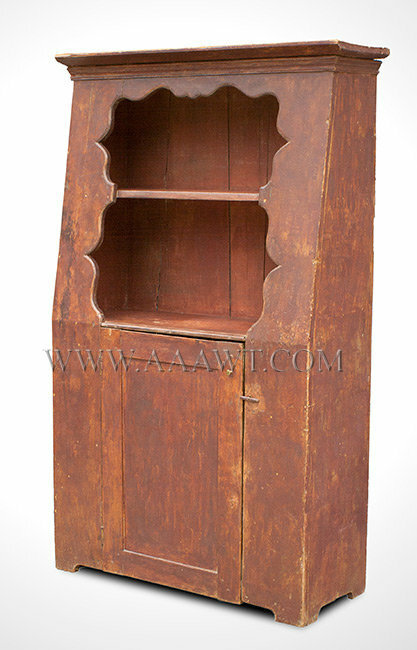 Dimensions: 51.25" H, 20" D, 37" W.
The case with cornice features a pair of molded recessed-panel-doors set within beaded opening; interior with four shelves. 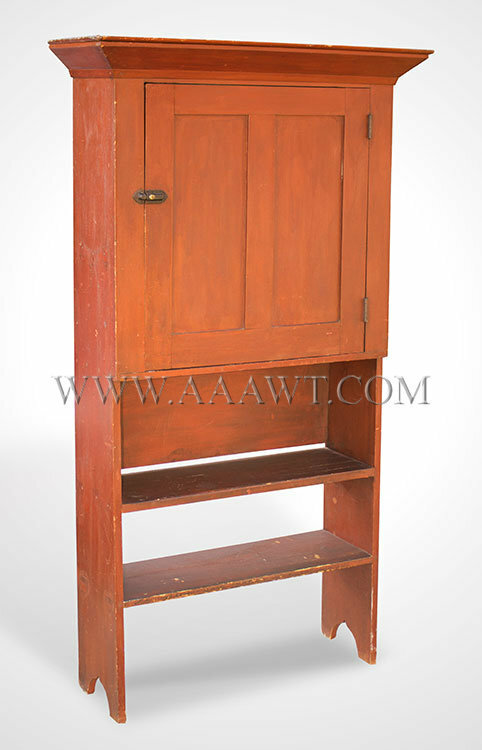 Beautiful dry red surface; dimensions: 36" H, 37.25" W, 13.5" D.
Dimensions: 92" high, 42" wide, 20.5" deep. 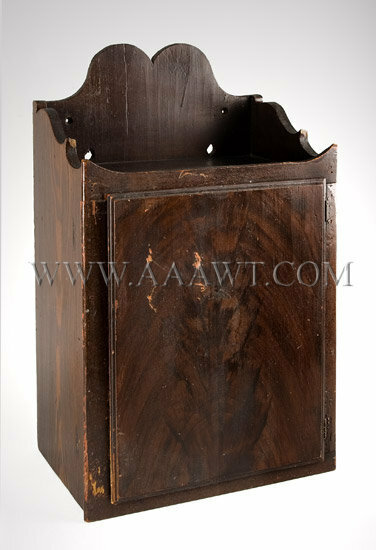 The rectangular pine case with molded front corners is raised on cutout feet and features applied molding above the removable two-board door with nicely molded edges and double tapered interior inset tapered battens. 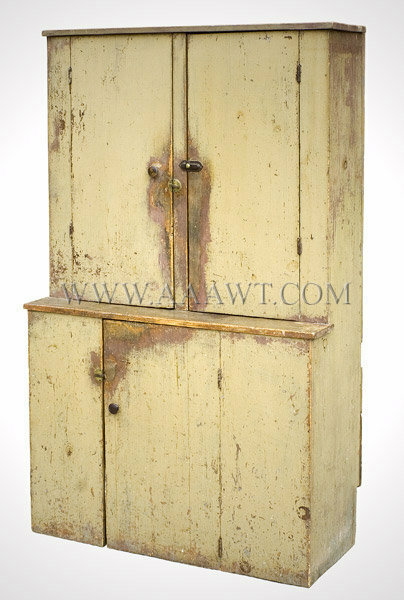 The door hangs on original iron pintle hinges that retain leather washers; iron slide-bolt latch appears to be original. 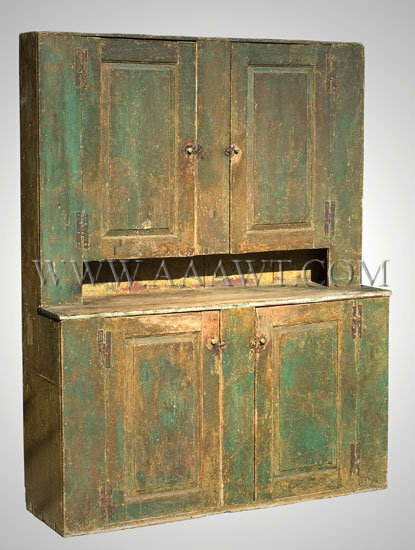 The surface has character, early 19th century green paint over original red paint with great patina. The tongue-and-groove backboards are affixed with rose-head nails. The case is raised on cutout feet, the side profile slightly arched; the rear feet show more wear than front. 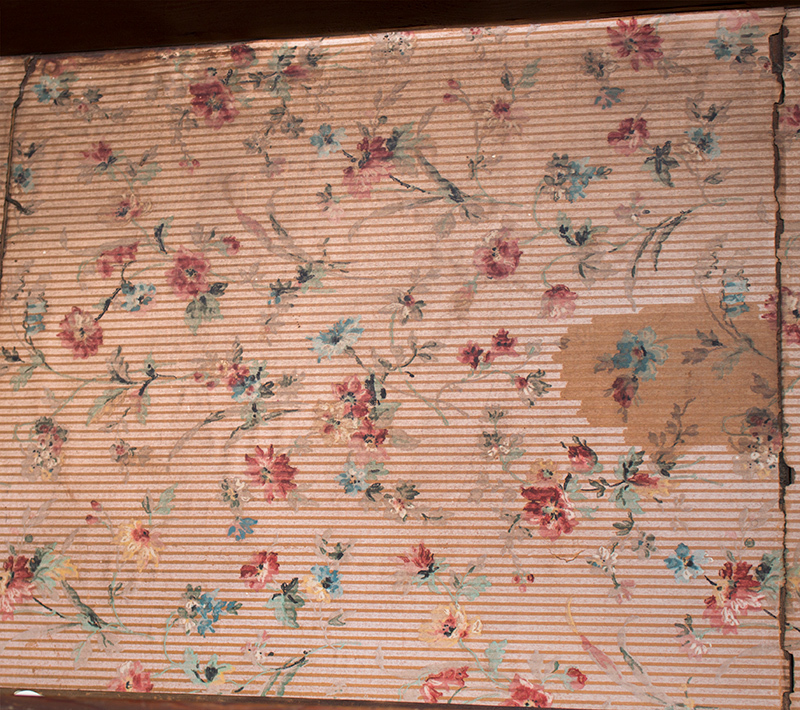 It appears that a horizontal base molding is missing and the cupboard shows wear from use otherwise fine.